Judge Mark W. Klingensmith grew up in Melbourne, Florida, as the oldest of three children. After his family moved to the West Palm Beach area, Judge Klingensmith attended John I. Leonard Community High School where he graduated in 1978. Judge Klingensmith’s first job was working for his father installing telephone systems during high school, continuing over the summers while in college. Judge Klingensmith started at the University of Florida in 1978, and graduated with a Bachelor of Arts in 1982 and a Juris Doctor in 1985. He was a member of UF’s Florida Blue Key, President of Phi Alpha Delta Law Fraternity, and Editor-in-Chief of the Florida Journal of International Law. His service to the university has continued. In 2006, he served as President of the UF Law Alumni Council, and has served on the Law School Board of Trustees since 2011. Judge Klingensmith is a loyal double Gator, rarely missing a home football game. Judge Klingensmith decided early on a career in law, around the age of 6, having been influenced by his favorite childhood television show, Perry Mason. That interest never wavered. One teacher remarked to his parents that she believed he had a “gift of gab” that would serve him well as a lawyer. At the same time, he also developed an interest in politics, which continued through college where he majored in Political Science before attending law school. This interest continued beyond school, leading him to become involved in many state and local political matters. his practice largely consisting of health care related litigation, specifically medical malpractice defense, as well as employment and licensure issues. Judge Klingensmith is married to Wendy H. Werb, a Magistrate for the Nineteenth Judicial Circuit. They will celebrate their twenty-sixth anniversary later this year. They met in 1986 when she was a paralegal at Metzger and Sonneborn. She left the firm to attend UF law school, graduating in 1991 before they were married in 1993. In 1999, they moved to the town of Sewall’s Point in Martin County, which Judge Klingensmith describes as a wonderful community in which to live and raise a family. In 2008, a friend suggested that he run for elected office, which he did, and he was elected a Town Commissioner, becoming the Vice Mayor in 2009, and then the Mayor of the Town of Sewall’s Point from 2010 to 2011 before being appointed to the bench. Judge Klingensmith and Magistrate Werb have two children, Hope and John. Hope recently graduated from high school at age sixteen, and as a dual enrolled student, also earned her Associate’s in Arts degree. She plays violin and her main academic interests are biology and international studies. She was accepted to her parents’ alma mater this coming year. John just completed the seventh grade, plays bass guitar, and is an avid basketball player. John is also a First Class Boy Scout, and expects to receive his Star rank this summer. Judge Klingensmith was a Boy Scout himself, and now serves as an Assistant Scoutmaster for his son’s troop. He has also served as the District Chairman for the Treasure Coast District, Gulf Stream Council, Boy Scouts of America since 2008. He also serves on the Executive Board of the Gulf Stream Council and from 1993 to 1999 served on the Board of Directors for Palm Glades Girl Scout Council. 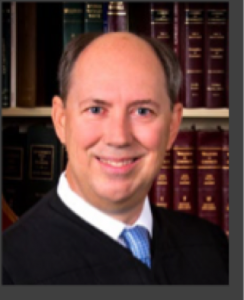 Judge Klingensmith decided to apply for a judgeship after a suggestion from a friend, Chief Justice Jorge Labarga, who was then serving on the Fifteenth Judicial Circuit. “My mom and dad always thought I would probably be a judge, or in Congress. But it wasn’t something I had been giving lot of thought to until then,” he recalls. Judge Klingensmith was appointed by Governor Rick Scott to the Circuit Court in the Nineteenth Judicial Circuit in 2011, and elected without opposition in 2012, assigned to divisions in St. Lucie County. Then, in August 2013, Governor Scott appointed Judge Klingensmith to fill the vacancy on the Fourth District Court of Appeal created by the retirement of Judge Mark Polen. Judge Klingensmith has a keen interest in professionalism. He has served on several Florida Bar Committees including the Rules of Judicial Administration Committee and the Rules of Civil Procedure Committee. He also served two terms on Florida Bar Grievance Committees. He has authored many articles and book chapters, including a chapter on the Attorney-Client Relationship, found in Florida Civil Practice Before Trial, and Opening Statements, found in Florida Civil Trial Practice (both Florida Bar Publications). Although he developed a love for trial practice during law school, his motivation for taking the California Bar stemmed from a desire to prepare for a possible future career change to pursue another early interest—entertainment law. Judge Klingensmith’s other passion is martial arts, and he has a Black Belt in Shaolin Kempo, a Chinese fighting style. While he enjoys both golf and tennis, he hasn’t found time to play much of either lately. The one indulgence he does find time for is riding his Harley motorcycle, a 2003 Fatboy (100thAnniversary edition). His wife has a 2002 Harley V-rod, and they both enjoy weekend rides up and down the Treasure Coast. Although he misses being in court everyday as he was when serving on the circuit bench, he enjoys the scheduling flexibility and more so the intellectual challenge, that the appellate court offers. The one drawback he notes is that his caseload does not allow much time for recreational reading. When he does have time, he prefers nonfiction history and biographies, but lately have been in the form of audio books listened to while driving each morning to the court. When asked about any recent books he has read, Judge Klingensmith especially recommends any of David McCullough’s books, including his biographies of Presidents Truman and Adams. Judge Klingensmith also recently finished two books written by Justice Sandra Day O’Connor, as well as another, Lone Survivor written by Marcus Luttrell about a failed U.S. Navy SEALs mission. In fact, Judge Klingensmith’s reading schedule just got even busier. At the time of his interview for this article, Judge Klingensmith was at Duke University in Durham, North Carolina, enrolled in the Masters in Judicial Studies program, attending his first summer session toward completing his LLM degree. Next summer, Judge Klingensmith will return to Duke for the second session of coursework, leading to work on his Master’s thesis before graduating in 2016.